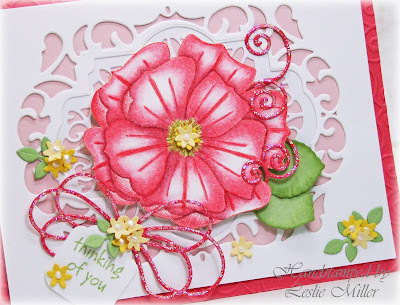 Hello, and welcome to another Monday on our blog of Dies R Us Inspiration! Today I’ve colored one big flower and die cut a scattering of little flowers. Why is it that I’ll make and send flower cards all year long, but I wouldn’t send a fall or winter card in the spring or summer? I love fall cards, but it seems their season is so short. 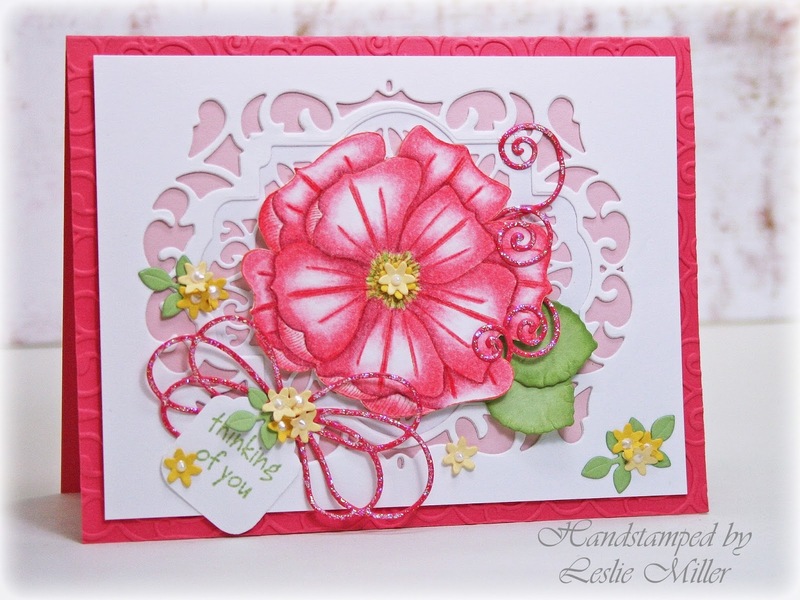 At any rate, it’s still summer, so a flower card it is! My big flower is from an older Penny Black set called To You. It’s stamped in guava ink and colored with Prismacolor Pencils and Gamsol. In the flower center and scattered about are Impression Obsession Tiny Flowers and Impression Obsession Leaf Cluster. Both dies will cut many flowers and leaves all at once, and with die cuts this small you generally will want that. These are perhaps not the dies that most catch your eye when you’re window shopping, but they’re infinitely practical and useful. The loopy bow is Impression Obsession Large Bow and is one of my go-to dies. I almost always cut the curly tails off, but see those delicate tendrils curling around the large bloom? Those are the tails from the bow. I cut an extra set of tails to get more tendrils. Pretty! It’s all backed up with some layered cuts from the Sue Wilson Porto die set. 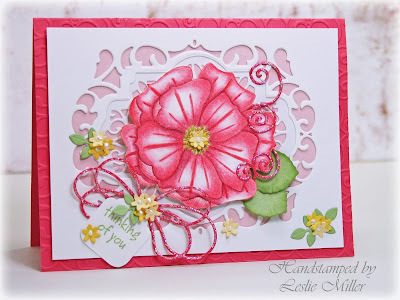 The tag is punched and the leaves of the big flower were made with the older Spellbinders Foliage Shapeabilities. I was in a glitter mood when I made this. Don’t you love the sparkle of glitter catching the light? Oh, and by the way, the pinks on this are not nearly as bright as they appear in the photo. Funny how every other color is right, but the pink is absolutely shouting at you. Just a reminder: The Dies R Us Team A ladies are kicking off a new challenge on the Challenge Blog tomorrow. The theme will be Back to School. Our Great Outdoors Challenge resulted in some amazing and varied entries. We were WOW’d! It’s worth your time just to check out the inspiration to be found in the links, but we’d love it if you’d play along, too. You might win a gift voucher to the Dies R Us store! Well, that’s it from me today. Thanks for stopping in! This is awesome Leslie! Love the pretty flowers (big & small) and that 'loopy bow' is now on my wishlist! THANKS!! LOL! !